The Ventura Surfrider Chapter is proud to announce the completion of the “Growing the Beaches” video. 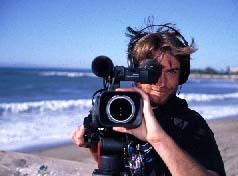 A collaboration between Paul Jenkin (“the beach erosion guy”) and videographer Robin Chilton, “Growing the Beaches” is based upon Paul’s highly successful slide presentation. The video includes rare footage of epic C-Street surf and guest interviews of essential players in the ongoing efforts to restore Surfers Point and the Ventura River. “Growing the Beaches” provides a basic understanding of the workings of our coastline, and makes the case for removing Matilija Dam an obvious “no-brainer”. This video was produced on a minimum budget through grants from Patagonia/Great Pacific Iron Works, the Surf Industry Manufacturers Association (SIMA), and the Ventura Chapter. Additional funding was provided by the Long Beach and Santa Barbara Chapters of the Surfrider Foundation. The public debut of this unique production was held at the Patagonia GPIW store in Ventura on March 30, 1998 at 7 pm. The event included the slide presentation and video. Film participants and local politicians were on hand to answer questions about the restoration of Surfers Point and the Ventura River, both of which got underway this year. What is "Growing the Beaches"? "Growing the Beaches" is an educational program that illustrates the causes of coastal erosion problems in Ventura County and promotes a policy of beach restoration for shore protection as an alternative to seawall construction. · The Ventura County Chapter developed a "managed retreat" approach to solving the chronic erosion at Surfers’ Point. The City of Ventura has adopted Surfrider input into a Shoreline Restoration Plan for Surfers’ Point. A first in California, this project will set a precedent for beach restoration on the West Coast. · "Growing the Beaches" also promotes the long-term goal of restoring the natural flow of the Ventura River. Local politicians are now addressing the possible removal of Matilija Dam whichwould allow the river to deposit up to 30% more sand on the beaches as well as provide for a rejuvenation of the historic runs of Southern Steelhead Trout in the Ventura River. · In San Clemente, a proposed seawall and bike trail on the beach was cancelled due to opposition generated by a public meeting that included this Ventura case study.